Now that I have 200 posts under my belt, I thought I’d kick off something new. Which is why, today I’m debuting an occasional series on a childhood in Queens. Any resemblance to my childhood is strictly more than coincidental. 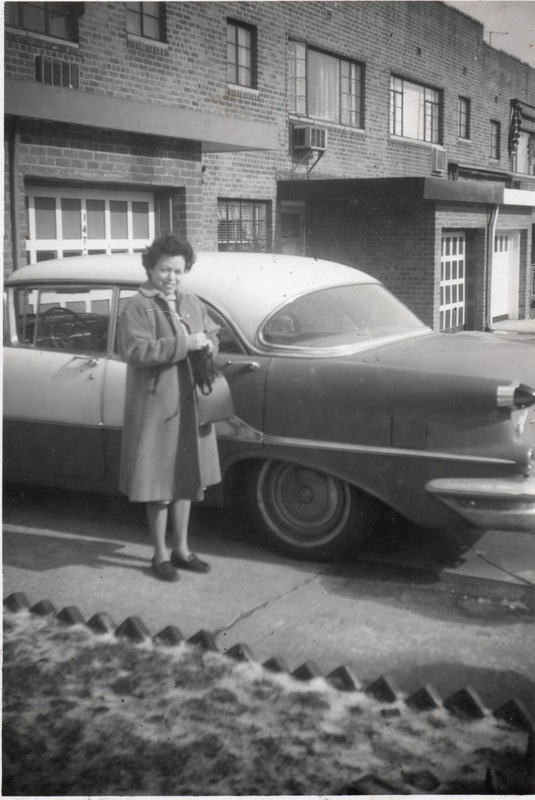 My mother in front of our home, Feb. 1962. Then, after you read the first installment, please check out my latest piece for the Huffington Post, because, if you ask me, there’s got to be a better way to elect a POTUS (for those not in the know, that means, President of the United States). Hands down, the best part about living in Queens was being a kid there. And, yes. I know what you’re thinking. Queens? Why Queens? I realize it’s not as shi shi as, say, Manhattan’s Upper East Side. But, when you’re a kid who doesn’t know any better, who tends to look on the bright side of just about everything, and who comes from a family that is trying to find its place in a new country, Queens was badass. First, there’s the neighborhood. We lived in what must have been the toilet bowl of Queens, otherwise known as, Flushing. (Really, what kind of a name is Flushing?) On either side of the street, was a long row of brownstones, that looked like a series of shoe boxes stacked horizontally and then glued together, making us all very close neighbors, indeed. No one had air conditioning, so in the summer, when it was sweltering, sticky hot, and our windows were wide open, if anyone on the block lit a cigarette, we’d all know. It would waft through all our homes. On the flip side, when Mrs. Moskowitz, who lived six doors down, made her famous noodle kugel, I could tell whether she’d added apples to her recipe, just by the scent that made it through my bedroom window. I could even tell when it was out of the oven and ready for eating. Our three-story, three-bedroom brownstone was second from the end, on the north side of the street. You could tell which one was ours just by looking at all the roses we had in our front yard, along the fence. Pretty miniature roses in white and pink. Caddy-corner from where we lived was an apartment complex with a small playground, to which I could run over and play. It had monkey bars, a see saw, and swings. In fact, that’s where I got the first bump on my head, when I fell off the swing and landed on the hard cement below. Public transportation, whether the bus or the subway, was spitting distance from our home, as was anything else a kid could need. To get to the A&P supermarket, all I need do was walk two blocks to Main Street and turn right. I loved going there, because when you bought your groceries, they’d give you S&H Green Stamps, which you could exchange for valuable goods, including toys! Once you’d collected enough, that is. If you crossed the street and headed north on Main Street, you’d hit the bakery, and eventually, the movie theater and the public library, which was in the same building as the Queens Savings Bank. The S&H Green Stamp processing center was also down that way, and the candy store was south, on Union Turnpike. Once, when I was running up the hill toward Union Turnpike, with my brother, Ralphie, I spotted a quarter on the pavement. Do you have any idea how much candy you could get with 25 cents? Well, my brother and I went to town on that quarter, buying a couple of bars of Hershey’s chocolate, a Chunky, and a set of wax bottles filled with brightly-colored, sugary sweet liquids that would leave a film of pink dew on your teeth. Cavity city! I couldn’t have planned my neighborhood better. Even the Five and Dime was nearby. No one had to drive us anywhere. We had our legs and could run like the wind, as they said in the ads for Ked’s Sneakers. And, as far as I was concerned, some of the other places around the neighborhood, like the hardware store, the deli, the shoe repair shop, and the church, were necessary, but boring. Being a kid meant I didn’t have to give a hoot about those. My parents came to Queens from Venezuela. They must have taken one look at the elevated trains, the grimy subways, the nonstop traffic on the Triborough Bridge, and decided they wanted in. Which is why, they settled in Queens. There were eight of us living in our brownstone, including my father, who was enrolled in a university in the city. I was glad of this, because it meant he was rarely around. When he was at home, he often had a temper so bad, it scared me. Like Ricky Ricardo, when he’d yell at Lucy in Spanish. That was my father. Only ten times worse, especially when he had his belt in his hand, at the ready. You wouldn’t want to be within a five-mile radius when he brought that out. There was my mother, who was studying to get her cosmetology license, but soon became the first beauty school dropout I ever knew. Yet, while she was attending, I got all the free haircuts I could want and then some. I was her guinea pig, which explains why my hair was always uneven and short. Oh, and by the way, I hate pixie cuts. I had four brothers who all slept in the room next to mine, their twin beds lined up in a row, leaving no space for anything else in that room. You’d have to crawl over the beds to get from one end to the other, and anything they owned, including clothing, had to be stored under their beds or in the closet. Meanwhile, I only had to share my room with Carmen, who had come to live with us before I was born. She was 17 at the time. Carmen would take care of us while my mother traveled to Caracas, and believe me, my mother was gone a lot. So much so, that I took to calling Carmen, “Mommy.” She was pretty and energetic, made a mean melted Velveeta sandwich. Best of all, she’d shoot baskets with my brothers, and play Chutes and Ladders with me. Yes, Queens was a kids’ paradise. We had the run of the neighborhood, and a bevy of kids around to play. We were young and full of adventure. And for eight years, this was the only home I knew. It didn’t matter that we were the only Latino family in our Jewish neighborhood. This was my block in Queens. Welcome to my neighborhood! Now, what was your neighborhood like? I’m a little late but wanted to say thanks for bringing back the Green Stamps memory. I was the kid who did the lickin’ and stickin’. Mom let all of have some kind of say in what she bought with them. So began my life-long obsession with looking through catalogues. I love that photo of your mom. We may have grown up in completely different neighbors, mine being San Carlos, a white-bread small town about an hour south of San Francisco, but our memories and experiences are nearly identical. From the Velveeta sandwiches, to the head bumps on the pavement playground and nickle candy bars. I love this walk down memory lane. Kids today don’t know what they’re missing. Oh — and I had a “belt-wielding” parent, too. Great post, Monica. I really enjoyed this. Jayne, in some ways, this is probably more about being a Baby Boomer than it is about where I grew up. For, some of these experiences transcend where I live and were shared by many children of the era. Would love to hear more about your neighborhood! I love this and I loved looking back at my own childhood. We lived in a suburban neighborhood, so there weren’t a lot of very close stores, but we could walk to an ice cream store and a small branch library. On our bikes, though, we could get anywhere. My sister and I spent all summer outside with other kids in the neighborhood and everybody had the same rule… you had to be home before the street lights came on. I don’t think many kids today have that kind of freedom. It seems like all of their play is organized and supervised and it makes me a little sad. Shary, I so agree. Maybe that’s one of the things about my childhood I love best: the freedom to just be kids, draw pictures, play at the playground, or run to the candy store. It was okay. I remember in the summer months we’d be out late playing on the street Simon Says or Red Light, Green Light. Mother May I?, too. There’d be 15 or 20 of us and it was heaven. I really miss those days. Ah, childhood! Reading about your childhood makes me smile and brings back memories. I remember those S&H Green Stamps. (What were the yellow ones?) We dreamed about the toys in the redemption catalogs almost as much as we did Christmas wish books from “Monkey Wards” and Sears. And we used to rinse out those wax bottles after sucking the juice out so we could stuff them with lightening bugs. May I add your Tangled Web to my blogroll? I don’t always check email so if you are on my blogroll, then your blog is just a click away… I hate to miss a post! Nancy, it’s nice to see here, in the comments, just how many do recall the S&H green stamps that were given away at grocery stores and gas stations. Practically all our household goods were the result of trading in those stamps. I could still recall the taste of the adhesive on the back of those stamps, and how some of the stickiness would transfer on to my fingers. I grew up in Brooklyn, as I think you know, which, as close as it is to Queens, might has well be another world. I love the picture you paint here of your early years (even with its mix of moods), so much of which has some resonance in mine — candy stores, supermarkets, buses and subways. A Five and Dime store. My childhood was a relatively new middle-income housing project. My grandmother (and later my uncle) owned a candy store and I have memories of sometimes working behind the counter, scooping out ice cream, making egg creams. Now there’s a story yet to unfold. See what you got started in me? Monicas excellent posting has inspired me to do a posting along similar lines in my blog. It’s always interesting to see how people lived when they were young across the world, you then realise that sometimes despite the distance lots of things are common to both them and you. Egg creams! Deborah, I haven’t heard those mentioned in a long time. But, frankly, I never liked those. Chocolate Malt or Strawberry shakes were more my speed. I once ordered a Root Beer Float, just to try it, and couldn’t finish it. Couldn’t take to the combo of soda and ice cream. It’s always nice when you discover shared memories. I hope you turn your memories of your neighborhood into a post very soon! 😉 Would love to read about it! Ha! Lighting that cigarette on the block could cause a riot with no AC. Sounds like a good start to a coming of age novel. Thank you, Totsy! Back then, I kid you not, we had the biggest snowstorms on record and the hottest summers. New York has rarely seen a snowstorm like the ones we had in those days. 😉 And the summers were sweltering, and everyone smoked. Even my parents at one point. Ah, the good old days! Great post Monica. Wonderful to read about your childhood neighborhood. Thank you for sharing your memories. Love this post and that photo of your mom! Can’t wait to read more. I grew up in small pulp and paper mill towns. Lots of wide open space but not lots of city excitement. Still … I have fond memories of the days that my mom would set me out on the doorstep like a pet, as my older brother and sister went off to school, and telliing me not to come home until lunch (and I wasn’t even in school yet!). Parenting and supervision expectations were a little different back then, no? Astra, I can’t believe your mother would put you out on the stoop! How funny. We would never do that today. Yes, we were more lax back then, which is why I had the run of my neighborhood. Different times, indeed. Monica, I loooove your neighborhood! & I adore that photo of your beautiful mother. Fabulous. Just Fabulous. Thanks, Kim! I’m glad you liked the photo of my mother. Lucky for me, my father took lots of photos of all of us, so I have quite a collection of photos–and memories! Those roses in our garden were all Carmen. She has a green thumb and I looked forward to Spring when we had an abundance of beautiful, aromatic roses! Now, I wish I had a photo of that! Monica we love this post! It is so nice to hear about your childhood. Thank you, Bella and DiDi! I’m delighted you enjoyed it. Thanks for stopping by! I too loved my neighborhood and have mostly fond memories of it. It was the first thing I wrote about in English 101 when I started college. I’m going to have to work some magic to get it off an old 2001 zip disk (strange to think of the zip disk as “old”). I always feel so connected to someone when they share their old photos. Your mother is lovely. I’d love to read about your neighborhood, so I hope you can get it off the zip disk and share. I really wanted to find a photo that showed our brownstone best, and this one of my mother, came the closest to achieving that. Thanks for reading! Britton, Of course, every neighborhood is unique, has pluses and minuses. Yours may have been a busy street (as was my Main Street and Union Turnpike), but sounds like you had very interesting neighbors. As a kid, I only saw the upside to my neighborhood. When I was in my teens, however, we lived in a house that was surrounded by two freeways and a very busy road, I kid you not. You had to cross the entrance to one of the freeways to get to the shopping mall, and the entrance to the main freeway’s exit ramp was at our front door! Yikes! Fabulous! Even if we didn’t want to go along with you on the ride, we readers were in too deep before we had a chance to think about it. A writer can’t help taking her past along the writing journey. It’s part of us and in some cases, makes us who we are or end up becoming after soul searching. In your posts, there is always love and kindness, especially here. If this is part of you larger story, you’ve got me hooked. After a recent stint without A/C when the heat pump died, my son got his first taste of being without cool air. He was shocked to learn that I grew up without it. That was the first thing I thought of reading your post. It’s nice learning all of these things about you and Queens. Monica, is this going to be part of your memoir?? If so, I think you’ve got a great start! You paint a wonderful picture of life in Queens during your childhood. I love the “current events” references, too — Keds ads, those wax bottles, Lucy and Ricky. Well done, my friend! This is my memoir, Debbie. I’m telling my story here to see how it shakes out, taking the pulse of my readers to determine whether there’s interest in it. I’m glad you like the touchstone pop culture references. I’ve been using them in my writing for a long time, because they’re such a part of who I am. So, in many ways, those references are my signature element that I weave into my stories. Keep an eye out for them! Excellent Post Monica, I am going to enjoy reading this series. I am convinced that our childhood experiences shape our adult future, do you agree. Love the description of the cooking smells, I can remember much the same thing where I lived when the neighbours cooked or baked. Of course, Robert. Our childhood, for better, for worse, is the foundation for everything else. What we learn then makes us what we are today and steers us in the path we take. The world has changed substantially since those days. For better and for worse. Your right Monica the world has changed since I was growing up in the 60’s in many ways we are less tolerant of others and have less time for both ourselves and other people. Modern communications means less personal contact between friends as well, I was chatting to somebody the other day about how teenagers seem to lack many social skills these days as most of their interaction with others is electronically rather than face to face. I am looking forward greatly to reading more, Monica, we were both born in the same year so it will be interesting for me to compare your childhood with mine as they were in greatly different areas of the world. Funny you should say that about today’s youth, Robert. Turns out, just today our President Clinton was interviewed and he said pretty much the same thing. That he worries about our youth, who spend so much time texting and not being in the present. How will they survive in the workplace and in life? I guest that remains to be seen. Monica, I can’t wait for more. I imagined so much from just this story alone, It was exciting, it added character to Queens – which I know nothing of, except from watching one of my favorite shows ‘the Nanny 🙂 so, when you say the ” only Latino family in a Jewish neighborhood” I could actually picture it. With all the grime, the close proximity to the neighbors and in spite of the circumstances… Do you know what I loved ? That you could go out to the park or run around with your brother and be free!! I have such wonderful memories of a childhood where my mum and dad never had to worry about my safety when I went out with my friends. I cannot imagine doing that now. Can you? I’m off to check out HP.. I like this new series! Oooh, I know we are going to love this new series!! I love your intro to your neighborhood and can’t wait to hear more about it! Seems like this is going to be a great series. I wonder how things would be different if I was not take from S. I. when I was five to Miami. Prob better off as there are too many avenues of mischief up there and may have unwisely gotten hooked up with certain people that have lots of vowels in their names. Carl, you missed out on a few experiences, but then you got some new, different ones as a result of your move. It’s what made you who you are today and I guess that’s all that matters, right? Don’t know if I managed to comment successfully at the HP, but I loved your swipe at Trump. That’s a tune I can really rock to! I’m so happy you checked it out! I’m so tired of Trump and his antics! Love this introduction to your world as a kid–especiallly your description of the neighbors’ cooking. I could lterally smell those aromas. Didn’t know you were Venezuelan. Caracas is the only city in South America I’ve ever actually visited. Now, I’m off to the HP!